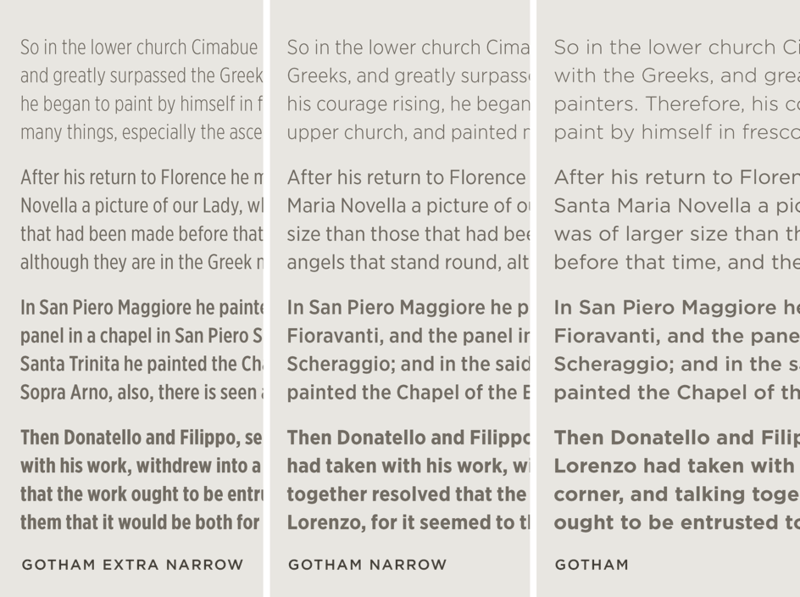 Gotham Font Features: Range | Hoefler & Co. Without sacrificing its appeal at display sizes, Gotham has been crafted to flourish in text sizes as well. The very qualities which recommend it to outdoor signage — ease of reading at a distance, and features durable enough to withstand the elements — make Gotham an excellent choice for small sizes as well. The bold and unambiguous capitals are easily differentiated, and the font's generous x-height allows it to be used in smaller sizes than might be expected. Gotham's short ascenders and descenders make it an economical choice for text, and the proportions of the new Gotham Narrow and Extra Narrow were specifically determined with text settings in mind.